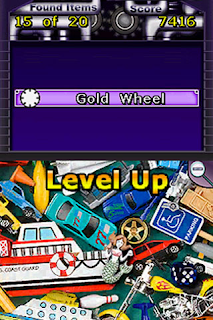 Our first review of November is a downloadable title for the DSiWare service. It also works on the Nintendo 3DS. If you are a fan of finding objects within a picture, then this first game I am reviewing this month will no doubt suit your fancy. It's Spot It! Mean Machines by Big John Games. As a kid in the early 90s I loved running to the mailbox and hoping that the latest issue of Highlights magazine came in the mail. It wasn't because I found enjoyment from reading the articles, seeing what new crafts I could create, or taking a look at what Goofus and Gallant were up to. No, I was most interested in finding that black and white hidden picture puzzle placed within the contents of every issue where objects were cleverly hidden within a picture and the reader had to find them all. Along those lines, here comes Spot It! Mean Machines. It's very similar in concept to those old Highlights puzzles except it's more of a game. You get a puzzle full of objects and ambiance that can be scrolled through via the d-pad, stylus, or a combination of the two. 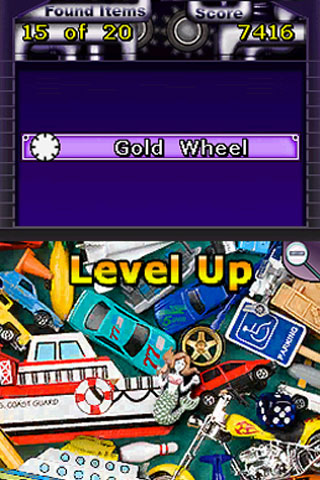 The game starts by asking you to find a specific item. The catch is that you have a limited time to find it and tap it with the stylus before it is locked out and no longer available (A clock is shown next to each item on the top screen to indicate how long you have). As more objects are found and in a quick fashion to boot, the more points you earn. The game ends when twenty objects have been found or locked, or when a certain number of items have been locked. This number depends entirely on which of the three difficulties you are playing on. Not only does the difficulty affect how many items can be locked total without getting a game over, but it also determines how much time you have to find a given object or item. 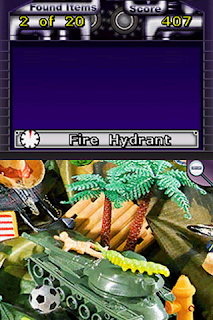 Locked objects can be blown up by finding an object that has a bomb next to it on the top screen. Discovering the hiding place of that object will destroy one locked object on your list. It's very handy, especially in more arduous difficulties. In the multiplayer mode (which offers play for up to four people) the number of objects that can be found is cut in half to ten. Players take turns finding ten items as fast as possible before passing the DS or 3DS onto the next person who then has to find the same ten items. The player with the most points at the conclusion of every player's turn wins. There are ten puzzles total in Spot It! Mean Machines, and you have to unlock each one. This generally just forces you to play through a puzzle and complete it to unlock the next. There are a plethora of objects to seek out and find -- bats, bears, bunnies, batteries, saws, scissors, sheep, letters of the alphabet, wagons, wheels, crickets, frogs, toilets, eyes, tarantulas, cookies, carrots, moon rovers, among many others. Even though the order of objects and which ones you have to find are random each time you play a puzzle, the placement of the objects always remains the same. You can get to the point within the game where you can simply memorize the general area of where an object is and find it swiftly to get the most points. To an extent, it almost feels like cheating. This lowers the replay value of the game, as does the lack of any kind of online leaderboards to compare point scores with fellow Mean Machines players. This title has a relatively simple presentation to it. Puzzles look like real life photos only with many more jaggies than expected. Sometimes objects can blend in or blur easily with the background, causing some confusion and frustration in trying to find them. The menus themselves are also relatively simple, but they're easy to navigate which is much more important than making someone drool at their sophistication. 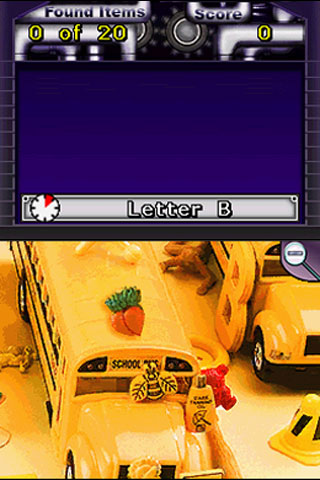 Every puzzle possesses the same musical theme. This can become tedious to the ears, but the piece of music is actually rather catchy. Spot It! Mean Machines is a good buy considering the amount of content and options available to it. It won't be a game that players will invest dozens of hours into, but it will be one that is superb for those with pick-up-and-play sensibilities. That's because a given puzzle only lasts about five minutes, if even that. 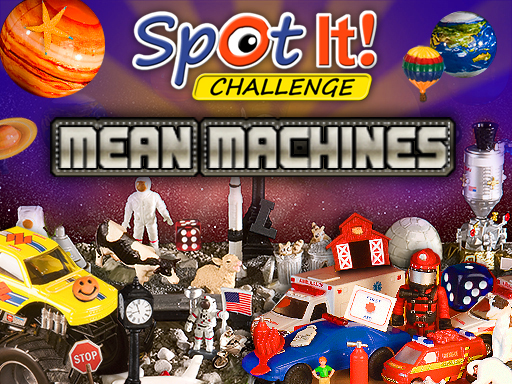 If you're looking for a game to make use of that eagle eye of yours, then it makes sense to try Spot It! Mean Machines.